For acidosis referring to acidity of the urine, see renal tubular acidosis. "Acidemia" redirects here. It is not to be confused with Academia. Acidosis is a process causing increased acidity in the blood and other body tissues (i.e., an increased hydrogen ion concentration). If not further qualified, it usually refers to acidity of the blood plasma. The term acidemia describes the state of low blood pH, while acidosis is used to describe the processes leading to these states. Nevertheless, the terms are sometimes used interchangeably. The distinction may be relevant where a patient has factors causing both acidosis and alkalosis, wherein the relative severity of both determines whether the result is a high, low, or normal pH. Acidemia is said to occur when arterial pH falls below 7.35 (except in the fetus – see below), while its counterpart (alkalemia) occurs at a pH over 7.45. Arterial blood gas analysis and other tests are required to separate the main causes. The rate of cellular metabolic activity affects and, at the same time, is affected by the pH of the body fluids. In mammals, the normal pH of arterial blood lies between 7.35 and 7.50 depending on the species (e.g., healthy human-arterial blood pH varies between 7.35 and 7.45). Blood pH values compatible with life in mammals are limited to a pH range between 6.8 and 7.8. Changes in the pH of arterial blood (and therefore the extracellular fluid) outside this range result in irreversible cell damage. General symptoms of acidosis. These usually accompany symptoms of another primary defect (respiratory or metabolic). Nervous system involvement may be seen with acidosis and occurs more often with respiratory acidosis than with metabolic acidosis. Signs and symptoms that may be seen in acidosis include headaches, confusion, feeling tired, tremors, sleepiness, flapping tremor, and dysfunction of the cerebrum of the brain which may progress to coma if there is no intervention. Metabolic acidosis may result from either increased production of metabolic acids, such as lactic acid, or disturbances in the ability to excrete acid via the kidneys, such as either renal tubular acidosis or the renal acidosis of renal failure, which is associated with an accumulation of urea and creatinine as well as metabolic acid residues of protein catabolism. hypoperfusion (e.g., hypovolemic shock) causing an inadequate blood delivery of oxygen to tissues. A rise in lactate out of proportion to the level of pyruvate, e.g., in mixed venous blood, is termed "excess lactate", and may also be an indicator of fermentation due to anaerobic metabolism occurring in muscle cells, as seen during strenuous exercise. Once oxygenation is restored, the acidosis clears quickly. Another example of increased production of acids occurs in starvation and diabetic ketoacidosis. It is due to the accumulation of ketoacids (via excessive ketosis) and reflects a severe shift from glycolysis to lipolysis for energy needs. Acid consumption from poisoning such as methanol ingestion, elevated levels of iron in the blood, and chronically decreased production of bicarbonate may also produce metabolic acidosis. Metabolic acidosis is compensated for in the lungs, as increased exhalation of carbon dioxide promptly shifts the buffering equation to reduce metabolic acid. This is a result of stimulation to chemoreceptors, which increases alveolar ventilation, leading to respiratory compensation, otherwise known as Kussmaul breathing (a specific type of hyperventilation). Should this situation persist, the patient is at risk for exhaustion leading to respiratory failure. Mutations to the V-ATPase 'a4' or 'B1' isoforms result in distal renal tubular acidosis, a condition that leads to metabolic acidosis, in some cases with sensorineural deafness. Arterial blood gases will indicate low pH, low blood HCO3, and normal or low PaCO2. In addition to arterial blood gas, an anion gap can also differentiate between possible causes. The Henderson-Hasselbalch equation is useful for calculating blood pH, because blood is a buffer solution. In the clinical setting, this equation is usually used to calculate HCO3 from measurements of pH and PaCO2 in arterial blood gases. The amount of metabolic acid accumulating can also be quantitated by using buffer base deviation, a derivative estimate of the metabolic as opposed to the respiratory component. In hypovolemic shock for example, approximately 50% of the metabolic acid accumulation is lactic acid, which disappears as blood flow and oxygen debt are corrected. Treatment of uncompensated metabolic acidosis is focused upon correcting the underlying problem. When metabolic acidosis is severe and can no longer be compensated for adequately by the lungs or kidneys, neutralizing the acidosis with infusions of bicarbonate may be required. In the fetus, the normal range differs based on which umbilical vessel is sampled (umbilical vein pH is normally 7.25 to 7.45; umbilical artery pH is normally 7.18 to 7.38). Fetal metabolic acidemia is defined as an umbilical vessel pH of less than 7.20 and a base excess of less than −8. Respiratory acidosis results from a build-up of carbon dioxide in the blood (hypercapnia) due to hypoventilation. It is most often caused by pulmonary problems, although head injuries, drugs (especially anaesthetics and sedatives), and brain tumors can cause this acidemia. Pneumothorax, emphysema, chronic bronchitis, asthma, severe pneumonia, and aspiration are among the most frequent causes. It can also occur as a compensatory response to chronic metabolic alkalosis. One key to distinguish between respiratory and metabolic acidosis is that in respiratory acidosis, the CO2 is increased while the bicarbonate is either normal (uncompensated) or increased (compensated). Compensation occurs if respiratory acidosis is present, and a chronic phase is entered with partial buffering of the acidosis through renal bicarbonate retention. However, in cases where chronic illnesses that compromise pulmonary function persist, such as late-stage emphysema and certain types of muscular dystrophy, compensatory mechanisms will be unable to reverse this acidotic condition. As metabolic bicarbonate production becomes exhausted, and extraneous bicarbonate infusion can no longer reverse the extreme buildup of carbon dioxide associated with uncompensated respiratory acidosis, mechanical ventilation will usually be applied. In the fetus, the normal range differs based on which umbilical vessel is sampled (umbilical vein pH is normally 7.25 to 7.45; umbilical artery pH is normally 7.20 to 7.38). In the fetus, the lungs are not used for ventilation. Instead, the placenta performs ventilatory functions (gas exchange). Fetal respiratory acidemia is defined as an umbilical vessel pH of less than 7.20 and an umbilical artery PCO2 of 66 or higher or umbilical vein PCO2 of 50 or higher. ^ a b Yee AH, Rabinstein AA (February 2010). "Neurologic presentations of acid-base imbalance, electrolyte abnormalities, and endocrine emergencies". Neurol Clin. 28 (1): 1–16. doi:10.1016/j.ncl.2009.09.002. PMID 19932372. ^ a b Yeomans, ER; Hauth, JC; Gilstrap, LC III; Strickland DM (1985). "Umbilical cord pH, PCO2, and bicarbonate following uncomplicated term vaginal deliveries (146 infants)". Am J Obstet Gynecol. 151: 798–800. doi:10.1016/0002-9378(85)90523-x. PMID 3919587. ^ a b Pomerance, Jeffrey (2004). Interpreting Umbilical Cord Gases: For Clinicians Caring for the Fetus or Newborn. Pasadena, CA: BNMG. ISBN 978-0-9752621-0-8. 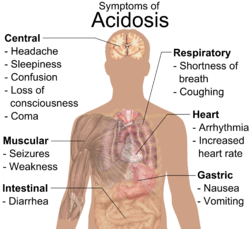 ^ "MedlinePlus Medical Encyclopedia: Respiratory acidosis". Archived from the original on 11 December 2008. Retrieved 2008-12-06. ^ "eMedicine - Respiratory Acidosis : Article by Jackie A Hayes". Archived from the original on October 29, 2008. Retrieved 2008-12-06. Hobler KE, Carey LC. Effect of acute progressive hypoxemia on cardiac output and plasma excess lactate. Ann. Surg. 1973 Feb;177(2):199-202. Hobler KE, Napodano RJ. Tolerance of swine to acute blood volume deficits. J Trauma. 1974 Aug;14(8):716-8. Rose, BD, Post TW. Clinical Physiology of Acid-Base and Electrolyte Disorders, 5th ed. (No content available.) 2000. New York: McGraw Hill Professional. Look up acidosis in Wiktionary, the free dictionary.